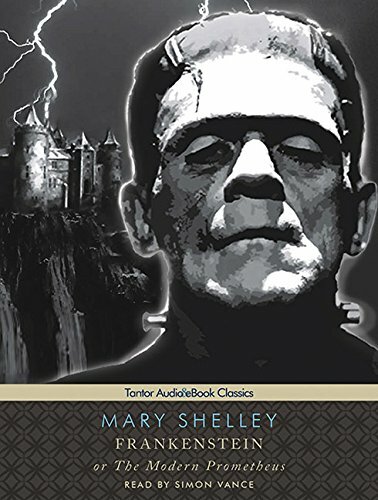 This year marks the 200th birthday of Mary Shelley’s “Frankenstein; or, The Modern Prometheus.” I began celebrating by renting the audio from the library, using the OverDrive app for the first time. OverDrive allows for easy borrowing, all it took was my library card. For non-Audible subscribers, or listening addicts like myself, it’s a great resource. Over the years, there have been different audios of this book, but I can’t imagine a better one than Simon Vance’s 2008 recording (Tantor). Vance has narrated many classics. That makes sense given his rich, sonorous voice. As the story opens, Vance’s deep, resonant voice captures the sadness and regret of Vincent Frankenstein, a near-frozen survivor rescued by Captain Walton in the North Pole. Frankenstein relates his tale as a warning to the scientifically-curious explorer who expresses an interest in experimentation. Frankenstein’s narrative frames the famous story, one of the first horror/science-fiction stories in literature. I savored Shelley’s vivid language while I waited to hear about the monster I’d seen depicted in movies. Instead, Frankenstein conveys more horror at what his scientific tinkering has wrought than the object of his invention. The centerpiece tale, nested within this frame, is told by the creature himself. Vance’s sonorous, full-bodied voice has a depth that evokes the intelligence and loneliness of a giant being who is hated by the humans with whom he wants to connect. This seems the real core of Shelley’s tale and Vance’s intonations, pauses and emotional emphasis express that by making the “wretch’s” painful isolation palpable and his ” vengeful spirit” understandable. The conclusion returns to the initial frame of Frankenstein’s storytelling and makes the tragic ending more horrific than any later conceits rendered by film makers. 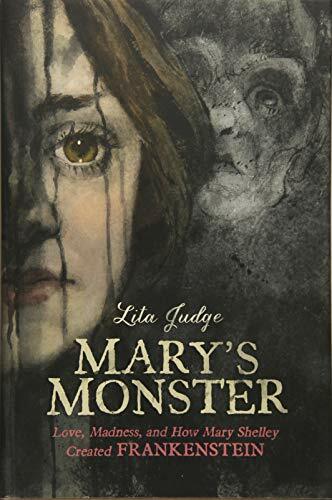 As a companion to my audio book, I read Lita Judge’s powerful biography, “Mary’s Monster: Love, Madness and How Mary Shelley created Frankenstein” (Roaring Brook; ages 13 and up). Judge further honors Shelley with poems separated into nine sections, a nod to the number of months it took Shelly to compose her famous work. Judge’s harmony of haunting black and white watercolors and image-strong first-person poems embrace the life of a young woman who surmounts judgment, deaths, isolation, poverty, betrayals, and disappointments with continued inventiveness. The biography traces her early life. Her mother dies after her birth, her cruel stepmother sends her away, she becomes lovers with Romantic poet Percy Bysshe Shelley, and publishes her novel, albeit anonymously. Judge’s emotive art invokes the essence of the young writer, her process and the characters she creates. The book’s introduction and back matter shows the author’s meticulous research.